This basic, simple short short long passing drill works on the very fundamentals of a soccer game. In a soccer game, typically after a couple of short passes of dragging defenders in close, a longer pass is then used. - For short short long, have your players in groups of 3, 1 ball per group. - Players A+C should be roughly 30-40 yards apart, with B in the middle. 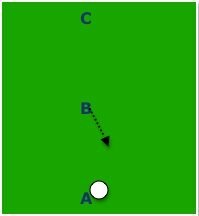 - Player A passes to B, B passes back on an angle to A, A plays a long ball to C. A follows pass to support C, B takes spot of A. Then C passes to A, A lays off on an angle to C, C plays long ball to B, C follows pass, A takes spot of C.
- Inside player makes quick run to support outside player. - Ball should be laid off at an angle, not directly back to outside player. - Players should communicate for the ball. - Players should use both feet, alternating right then left is good practice. - All passes should be firm and accurate. - Outside players should take 2 touch, inside player 1 touch. - This should be done with very high quality and efficiency. - All players use 1 touch. - Add a passive defender covering any middle player.